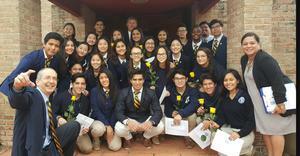 On Friday, November 30, 2018, we celebrated the induction of 18 new members into the John A. Mackay Chapter of the National Honor Society. These students were selected by their teachers as those who most uphold the ideals of scholarship, service, leadership, and character. During the ceremony, inductees were presented with a yellow rose from current members of the chapter. They also enjoyed a meal together after the induction ceremony. Congratulations, students! Presbyterian Pan American School is a Christian college preparatory school that educates and empowers young adults for leadership in the global community.